Founder of Peonies of Martinborough + Peonies Home & Living Di Lusk began her working life in the travel industry, spending time in India, the Middle East, China and Europe. Being exposed to different cultures and life styles meant that she soon gained an appreciation for design in both architecture and interiors. However, her introduction to design and detail happened long before her career had even begun. With her parents owning a successful and thriving interior business, Di grew up surrounded by fabric swatches, paint charts and design boards, so the style gene really was a given. In 2005, after almost 20 years in the world of travel, disillusioned by her work and in need of a change of lifestyle, Di moved to the rural town of Martinborough in Wairarapa, initially to help out her sister with her ever expanding catering business. 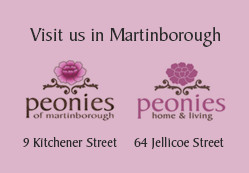 Not long after, along with her newly qualified builder partner, Dean, they purchased an existing local retail business, sourced beautiful new product, redecorated, rebranded and launched the giftware and clothing store, Peonies of Martinborough. 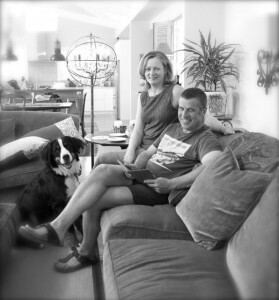 Having renovated a relocate, Di and Dean then immersed themselves in designing and building their own home. They filled it with worldwide sourced furniture, fabrics and lighting and shortly after were approached by the editor Sally Duggan and asked if their bespoke home could be part of the prestigious New Zealand House and Garden Tour. They agreed and the feedback they received was overwhelming. Both Di and Dean quickly realised that the public loved what they saw and wanted the same for their own homes. This, in turn, led them to expand the business and open Peonies Home & Living in March 2014. The new store allows Di and her partner to travel annually, looking for unique pieces of furniture and home décor from across the world for their valued and discerning customers. Di also runs ‘The Coach House’, an architecturally designed, stylish studio apartment in the heart of Martinborough.